Things were simpler when we were kids. When I was a kid, and I wanted a thrill, I knew right where to find it: the Big Dipper at the Santa Cruz Beach Boardwalk. Aaaaannnyyywaaay. So. The Big Dipper. 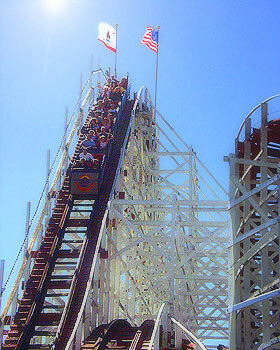 A classic wooden roller coaster built in 1924 (now a National Historic Landmark). Such thrilling awesomeness was rarely to be found on this earth, I could tell that from the start -- ever since I was too young to make the height requirement. But the thrill didn't start with standing in line with dozens of sweaty beach goers, listening to the screams and rattles and screeching. Oh no, the thrill began small. In that niggling little voice at the back of my head: was there any way, any way at all, to talk the grown-ups into a trip to Santa Cruz? I would have to recruit my sisters to my side, of course, and we would present a united front. A birthday or some other celebratory excuse was a great ruse. Promises were made, sad eyes maintained, wistful sighs manifested. Or perhaps another friend's parents were the more likely target...I tell you, there was a lot of strategizing, on and off stage. Would they or wouldn't they? My father claimed to hate sand, sun, crowds, and traffic, so he was a pretty tough sell. But if there was some kind of motorcycle event in town? Different story. Other parents were more reasonable, allowing the concept of actually planning a trip just for the kids...and I could usually talk my way into the back seat of the station wagon (the one that faced backwards). Later, as a teenager, there was usually an older brother or sister who could be bribed or otherwise coerced into making the schlep from Cupertino, over the hills to paradise. And then, once you secured a ride: cash money. You needed enough for a corn dog, maybe salt water taffy, and to get as many rides on the Big Dipper as humanly possible. Me, I would go without food for the sake of another ride, but most parents were sticklers about eating at some point. Then came the wait in the loooong line, getting jostled by all the other anxious kids, bored, hot, and uncomfortable in damp, sandy swimsuits that chafed. Wondering whether, by chance, we would have the option of the very front car and if so, would we be brave enough to take it? Once on board, of course, the real excitement began. Careening around sharp turns in the pitch-black tunnel. And then, the very best part: emerging into the sunlight and the clicking, clackety haul to the peak of the very, very tallest hill. The cars climb the hill slowly. Achingly so. You finally reach the top. Okay, I was a tad obsessed. One of my fondest childhood memories was when a neighbor took my to the boardwalk as payment for vacation house/dogsitting, bought me a pass with unlimited rides, and I got to go on the Big Dipper over and over and over. And then, in what I swear was in no way connected to my roller coaster fetish, I wound up studying at UC Santa Cruz. That summer, I got a job -- again, it was pure serendipity-- at the corn dog stand that just happens to be right underneath the Big Dipper. One of the perqs of being an underpaid Boardwalk employee and dealing with hot, sweaty tourists all day? A free pass to all the rides. I kid you not. Okay, it's true I was sharing a roach-infested "studio apartment" in a crappy converted motel which called itself, in a fit of misplaced optimism, "Aloha Court" (the other residents included a disturbed Viet Nam vet, a heroine-addicted couple, and several Mexican immigrant families who worked the fields.) 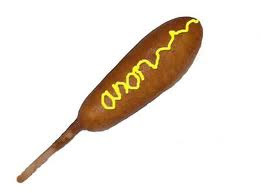 I smelled like corn dogs all summer long -- a mealy, greasy aroma that permeated clothing, skin, and hair. But it was thrilling, riding that Big Dipper any time I wanted...and being out on my own. Doing what I damned well pleased. If that included eating taffy for dinner and riding the Dipper five times, then so be it. Since then there have been other thrills in life: Seeing lightening bugs for the first time. The birth of my son. Praying the erratically driven bus didn't go over the cliff in the Philippines. Falling in love. Running into the Tour de France, completely by chance, in the Pyrenees. Trying to take care of bodily needs out in the pig corral at night in a Mexican village. A night spent in an actual castle. Selling my first book, then seeing it on the bookstore shelf. But things get more complicated when you grow up. Not harder, necessarily, because I think childhood is hard. But definitely more complicated. Sometimes it's difficult to find a really good thrill -- at least a legal one. Now, in one of those funny twists in life, my son is studying at UC Santa Cruz. After dropping him off at the dorms, my friend (and former corn-dog-stand co-worker) and I hopped onto the Big Dipper for old times' sake. We were the oldest people in line --by far-- but we scored the very first car! Held our hands up, screamed, laughed, and did ourselves proud. It was a real thrill. Oh, Juliet, great post. The Big Dipper held a powerful appeal even out here in the far East Bay, but my mother was offended by roller coasters (hard to explain) and my dad was afraid of heights so we never, ever, not one single time went to the Boardwalk. We'd go to Santa Cruz and Monterey, but there was always a strong John Steinbeck theme to our trips. Or California history. My parents hauled us all down to San Juan Bautista to the old mission several times, but no amount of pleading got us a side visit to the Big Dipper. And then, I discovered, to my eternal shame, that roller coasters both frighten the living daylights out of me and induce motion sickness. Not a thrill, sadly. I'm so glad you confirmed it's the Big Dipper; I keep calling it that and getting corrected, and I thought I was losing my mind. Now I know why. I've been on many newer and fancier coasters, but I still swear that one's the best. It's just perfect, and the added thrill you get from seeing the screws shake in the wooden frame as you're in that slow climb.... It gets me every time. Thanks for the GREAT post! And feel free to appropriate any of my youthful experiences!!! Hey jujuwiz, BIG DIPPER! Hahaha we'll start a revolution! And yes, the shaking of the screws out of the already wobbly wooden beams is aaaawesoooome! I am SO impressed, Julie! I sold cotton candy under The Cyclone at Revere Beach, another icon of roller coaster history. BUT I would never get on it; instead I traded my free tickets for frozen custard. You can still see the effect on me today. I remember after the earthquake, how miraculous it seemed that the Big Dipper still stood--though the fence around it had been pushed out. By the movement of the earth, or of the great lady leaning, I've never discovered. It's one of the few golden era, wooden coasters left. My stint at Uncle Charlie's Summer Camp was not informed by the Dipper, I rode it only after I'd been in town a few years. My friends were mostly townies, and they'd had their fill of the Boardwalk, so it took a LOT of badgering to get there...but my townie pals enjoyed it once there. so funny, that Giant Dipper is the one ride I'm NOT excited about at the boardwalk. I always go at least once (yes, we still drag the big kids there once a year!) but i don't like all the jarring. My fave is the really scary one that spins you around and back and forth at the same time! Also I love watching them make the fried cheese. taht's a thrill that don't get old. Time to schedule our annual trip, i think!